Ben Bateman celebrates for Aylesbury v Bedford. Bedford were beaten at the Eyrie on Saturday by an Aylesbury side exacting revenge for a mauling on their own ground two months ago. Back in early October, Bedford’s run of good form started with a demolition of Aylesbury on their home turf. Since then the side has excited the Bedford fans with an FA Trophy run and improved results in the Southern League Premier. Hopefully just a temporary setback, including the defeat at Chalfont St Peter the week before, Bedford were beaten at the Eyrie on Saturday afternoon by a revengeful Aylesbury. The early exchanges didn’t produce much in the way of goalmouth action. Garry Malone, in the Bedford goal, punched away a corner, whilst his opposite at the other end, James Weatherill, saved a Bedford free kick. With a third of the half gone, though, Aylesbury took over. Malone dived low to deflect an Aston Goss shot. The visitors kept up the pressure, and should have gone 1-0 up on 21 minutes. A cross from the left wing took a slight deflection off Stuart Smeathers, straight onto the head of Brian Haule. With the goal at his mercy, the Aylesbury striker managed to plant it over the bar. A minute or so later a weak back header from Smeathers failed to reach Malone, allowing Lynton Goss to nip in. For the second time in as many minutes, a goal for the visitors went begging as Malone came racing out of his area to tackle the ball off Goss. Callum Lewis carved out Bedford’s best chance when his right wing cross found Tom Liversedge, at the far post, whose header grazed the top of the Aylesbury bar. A couple of minutes later, on the half hour, Aylesbury took the lead when Ben Bateman took delivery of a free kick, pumped into the Bedford area. With time to control, Bateman slotted the ball past Malone. Yet another chance went begging, late in the half, when Aston Goss saw his goal bound shot deflected over the bar after Smeathers threw his body in the way. Five minutes into the 2nd half, Paul Cooper coolly slotted the ball under Weatherill after receiving a pass from Lewis, but any joy for scoring the equaliser was extremely short lived, because of an offside flag. Greg Ling then shot wide of the mark after Rob Parker had teed him up just inside the area. In looking for an equaliser, Bedford conceded a second on 57 minutes when a corner from the left was only half cleared, and Bradley Wadkins shot low through a crowded area to hit the back of the net. Cooper and Parker combined to set up substitute Tommy Glasscoe, midway through the half, but although the shot had a sting in it’s tail, Weatherill got down to save. After they wasted three good chances in the first half, Aylesbury were at it again with 15 minutes to go, letting another two to go begging. Firstly Wadkins played Aston Goss through the Bedford defence, but Malone forced the attacker wide and the ball eventually ran out for a goal kick. Secondly, and a minute later Malone denied Lynton Goss, as he narrowed down the angle on the midfielder, after a cross from the left had picked him out. 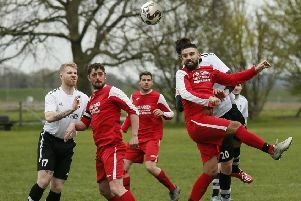 Whatever the reason for the five golden opportunities wasted, whether it was the sagacity of Malone in the Bedford goal, or the laces of the Aylesbury boots weren’t tightened properly, this could have been Bedford’s biggest defeat of the season so far, instead of just 2-0. The Eagles travel to Godalming Town on Tuesday (December 16), before going to Leighton Town on Saturday, December 20, and then onto Barton Rovers on Saturday, December 27. The next action at the Eyrie is on Thursday, January 1 as Bedford host St Ives Town. Eagles: Garry Malone, Paul Cooper, Joe Hopewell, Stuart Smeathers, Jeff Woodward, Ollie Wilkinson [c], Josh McGoldrick (Tommy Glasscoe 58), Callum Lewis, Tom Liversedge (Tom Rawlings 70), Rob Parker, Greg Ling (Russell Bull). Sub not used: Josh Winters. Moles: James Weatherill, Jeanmal Prosper, Daniel Murphy, Ben Bateman (Jamie Rudd 77), Kyle Anthony, Ben Stevens [c], Lynton Goss, Davis Haule, Brian Haule (Terry Dixon 70), Bradley Wadkins, Aston Goss (Gareth Price 82). Subs not used: Sonny French, Connor Baker. Referee: Mr M Law. Assistants: Mr K Hayward & Mr A Rayment.